The second piece I made was influenced by Game of Thrones. Late to the party as ever, I just started watching it. I'm on Season 3 Finale - I use it as a carrot to make myself walk on my treadmill for an hour. I am really taken by the wedding ceremony words George R.R. Martin wrote for Daenerys and Khal Drogo. "As you are the Moon of his life, he shall be your Sun and Stars. Your love shall be as ever present as those two celestial bodies...even though they are sometimes hidden from one another's sight. Your love will be the guiding force that charts the course of your tomorrows, holds your world together in difficult times, and will make life itself shine bolder and brighter than we human beings have a right to dream of." I was going to add some dangling stars to it, but since I'm not necessarily a dangly type person, I left it the way it is. They can always be added, anyways. Not sure what I'll do with it, I just enjoyed making it! I'm also posting for Kathryn Smith, as she does not have a blog. I found her on Instagram and when I saw her post this piece, I told her it was perfect for our theme challenge. 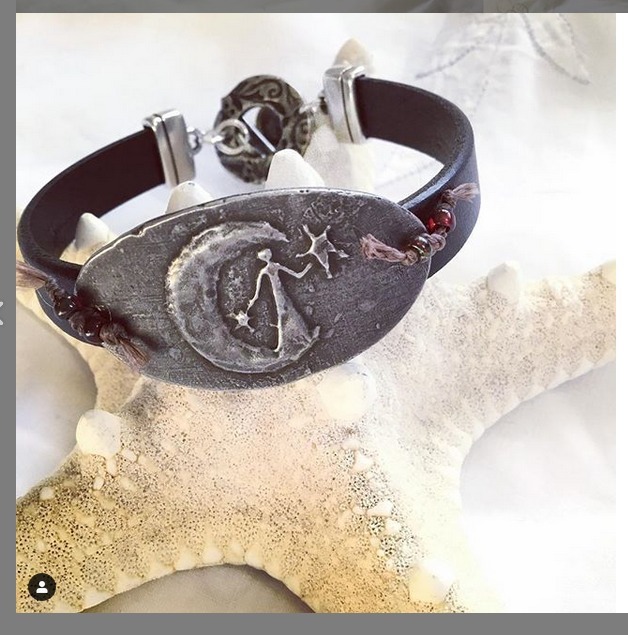 She used a connector from Inviciti for her bracelet! You can see her other creations by clicking on her name, it will take you to her Instagram! As this is a blog hop, I hope you visit and see what everyone else has made for the moon theme! Thanks Lindsay for a great theme choice this month! How pretty! I love black, and I love the dark beauty of your beaded piece. Totally something I would wear. That pendant is a lovely design and the red jade really makes it pop. Kathryn's piece is beautiful as well. The post is a feast for the eyes. I love your beaded pieces and I still treasure mine that you sent me ;) That pendant is a bit special and Kathryn's bracelet is gorgeous. I love that you used the same Inviciti pendant that I did. It is always fun to see how someone uses that same component. I love that piece. It is a major revelation to me that you applied ink. 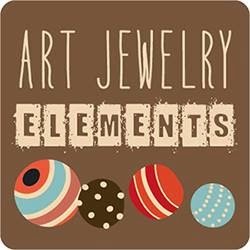 I have a pewter piece that I have been wondering how I could apply color. Now I know. Your necklace looks stunning in red. Well done! I love how you highlighted the moon with yellow to make it pop more - especially with the red jade beads. I also love the beading around the moon pendant - I think it makes it stand out more. I love what Kathryn did for the bracelet - that is so cool! Oh my! I love your first necklace-the red faceted beads really makes a statement with that pendant. I love that you highlighted the moon on the pendant, it reallly stands out nicely. Your moon face beaded pendant is FABULOUS!! I love the black face witht the white higlights around the features. Your choice of beads and bling really make it pop! And I forgot to mention Kathryn's bracelet. I love that connector and how she created the bracelet. Both of your pieces are just yummy! That red is great in the first piece. And, I love the gold touches you added to the pendant. Genius! As for your second, I have to admit that while it is great, I love it even more simply because it was GoT-inspired! I'm a big fan myself - read all the books, watched all the episodes, lamenting over the fact that in April the last season will begin. Sigh. Enjoy your first run-through of it! And, I'm headed over to Kathryn's IG now to let her know that I like her bracelet! :) So kind of you to share her work here for her! Those are some gorgeous red beads! And they look fab with that pendant, which I totally love and would be tempted to try to snag one for myself if I wasn't also on a spending freeze. The bead embroidery is perfection. I love it. Kathryn - your bracelet is just beautiful, I love its composition! Well done both of you! It was great fun to see similar Invincti ( SP? ) components in diverse ways. Sue the red is wow! I love the beaded face - and love how you arrived there with GoT. Kathryn - cool bracelet - thanks for joining us! I love the necklace you made... bold yet simple at the same time. That red is super yummy! I love the red, larger beads you used on the first necklace. They really mesh beautifully with the color of the focal. Your beaded cab is stunning, love the black and blue mix. It could be a brooch, pendant, arm band (can't think of the word ....) and why not a leg-chain type adornment in the summer? Start a new trend :).. Alysen. Oops, forgot to say to Kathryn that I love her style and will follow on social media. Gorgeous work ladies! Sue, that red is amazing, it's perfect with the pendant, the embroidery is fantastic and I love the cuff! Your pieces have a wonderful, mystical feel. I love the dark focals with the bright bursts of color. Well done. I love the simplicity of the necklace you made for yourself. I didn't know you could color metal with inks like that. It's a very subtle enhancement that is perfect for the piece. The dark moon cab is fabulous. I have not watched an GoT. I bought the books before the series was adapted for TV and am determined to read them before watching. So far, I am on page zero of book one. Katherine's work is lovely. I am glad you were able to add her to your post for us to see. I started watching GOT for my mom (and with her) so as to explain some scenes better and in the due course became a fan. GOT can do that to you and I can see its royal influence in your pieces. Your last piece reminds me of the last season's first episode. Kathryn's bracelet is charming as well. First of all, Kathryn, lovely bracelet! And Sue, both your pieces are delightful. Love the inspiration for the beaded cab and the red beads go perfectly with the pendant. I'm loving both the necklace and the beaded focal - one is simple but with striking color contrast and the other is a statement piece. Kathryn's bracelet is beautiful and she has many other talents, too! I love how you used the gold alcohol ink on the moon it makes the pendent a little more luxurious and the design of the necklace is beautiful as is your pendent! Kathryn your bracelet is beautiful I love the little red beads, its a wonderful pop of colour and really finishes off the bracelet perfectly! These are beautiful pieces, Sue and Kathryn!